Tulsi Gabbard’s only hope to mount a serious presidential campaign would be to quit the Democrat Party while proclaiming her deep regret for belonging the such a corrupt and dangerous crime syndicate. Then, she would have to express extreme remorse for ever supporting the closet communist Sanders and pedovore Clinton. 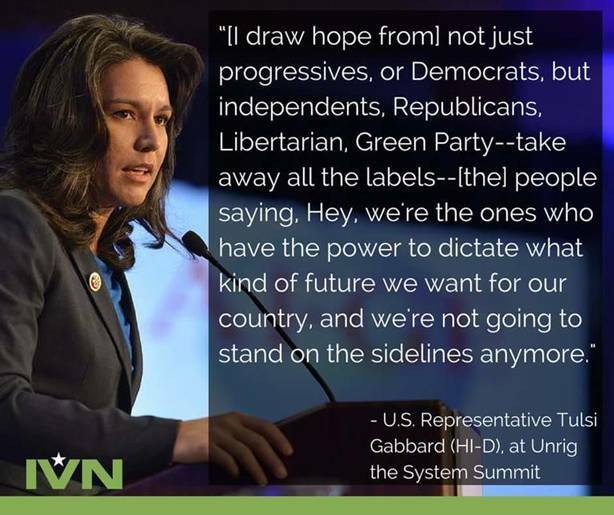 While Ms. Gabbard’s anti-war posture is admirable, she has a LOT of work to do to construct a credible platform that reflects real American values, not the fake Cultural Marxism zealously and stealthily advanced by the Democrat Party. If you run, Tulsi, prepare to get justifiably slammed for the rest of your liberal agenda that you embraced begrudgingly, but embraced nevertheless. It really does appear that you are a conservative at heart trying to fit on the ultra-progressive reservation. It can’t be done; therefore, be wise and quit now, and then go INDEPENDENT. Above all, ask yourself: Why would any Patriot or Nationalist, Christian or Conservative, Tea Partier or Libertarian, Republican or Independent ever vote for you as long as you remain in the Democrat insane asylum?!?! And you would need a LOT of US to win, yes? Really, what’s the point of staying Democrat, especially given the extremely perilous state of affairs throughout these United States of America? Either get serious, or don’t waste our time. Your quite excellent anti-war position is way too important to the country to become marginalized by launching a misguided run for POTUS (particularly as a Democrat). The Neocon warmongers will simply tear you to shreds as they have been wanting to do ever since you voiced extreme opposition to the hideous Syrian War. We do like you, Tulsi Gabbard, which is why this op-ed is full of tough love. You really ought to think about running as a VP candidate with a true conservative like Chuck Baldwin. That’s your ONLY hope to fulfill your higher political aspirations. The real bottom line here is that the Democrats can never again be allowed to take over the Executive Branch of the U.S. Federal Government. They have proven themselves to be — in the aggregate — so untrustworthy and treacherous, deceitful and dangerous, that the American Republic would be at great risk were a Democrat to become POTUS. Yes, we are saying that the Right will never again permit another president from what is essentially the Clinton-Obama Crime Syndicate. The nation would simply not survive such an unmitigated political, economic and social cataclysm. That’s not to say the Republicans are the good guys, by the way. It’s just that 2020 is likely to see a U.S. presidential phenomenon that even outdoes Trump. Wow… now just who might that be? !